The Global IT Challenge for Youth with Disabilities (GITC) 2018 was held in New Delhi from November 9 to 11, 2018. It was co-hosted by Department of Empowerment of Persons with Disabilities (DEPwD), Ministry of Social Justice, Ministry of Health and Family Welfare, Government of Korea and its organising partners namely Rehabilitation International Korea and LG Group. GITC is being held every year in Asia- Pacific region and such events were held in past in countries like South Korea, China, Thailand, Vietnam etc. The objective of GICT was to leverage IT skills among youth with disabilities and also to spread awareness about application of Information and Computer Technology in enhancing the quality of life of persons with disabilities. The event saw participation of around 300 participants including 120 Youth with disabilities from 24 Asia Pacific countries. It also had an IT Forum in which countries presented their work and achievement in ensuring accessibility to persons with disabilities in IT sector. Q. 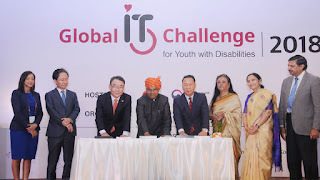 Where was the Global IT Challenge for Youth with Disabilities (GITC) 2018 held from November 9 to 11, 2018?